Daniel Sapp at Rocky Knob in Boone, NC. The riders in Boone, North Carolina, have a Christ-like way of crossing a river without getting wet. But it's not a miracle; it's spatial awareness. They use their bikes to bridge the gaps between the rocks, anchoring the tires into the river, then using the pedal as a stepping stone–the missing link between exposed, dry rocks. It's a key skill to have when you're riding Wilson Creek, a dank corner of Pisgah National Forest in North Carolina's High Country, where steep channels of dirt drop through rhodo tunnels and carve along the edges of river gorges. Creek crossings are obligatory. This isn't the well-known side of Pisgah National Forest–that would be the land between Brevard and Asheville that sees hundreds of thousands of rubber tires every year. Wilson, in the Grandfather Ranger District of Pisgah, sees a fraction of that traffic. This is the mysterious side of Pisgah, on the edge of the rugged Linville Gorge, where the Brown Mountain Lights have baffled locals and scientists for centuries (Google it). Where 40-foot-deep sinkholes add character to ridgeline singletrack–like traps in an Indiana Jones movie. Where Confederate soldiers stashed hundreds of guns in a local cave, just in case the South did actually rise again. Signage is sporadic at best; cliffs and rivers are par for the course. "You can still get way lost out here, and probably never run into another biker," says Ethan Anderson, a Wilson Creek regular for more than 20 years. He bagged 184 days riding last year, and is going for 250 this year. Wilson Creek has a reputation for big, burly downhills, like Beehive, which throws mini-fridge-sized boulders in your way, or Sinkhole, which carves a beautiful bench cut that hangs onto the side of a steep gorge for 3 miles, demanding total concentration. Boone, home to Appalachian State University, is the closest 'city'–that's in quotation marks because the year-round population is 18,000. Boone's mountain bikers have a reputation for localism, and are notorious for keeping a lid on their favorite trails. Some have even gone as far as removing signs and giving bum directions to outsiders. Ride Greentown–a jumble of water bars, roots and stupid-steep switchbacks that drops 1,500 feet in under 2 miles–and you'll understand why the locals would want to keep it to themselves. "For a long time, there was no cohesion in the community here," says Kristian Jackson, the trail boss for the local club, Boone Area Cyclists. "Everyone was doing their own thing. Riders even resisted when IMBA showed interest in the trail system in 2002. Everyone here imagined groomed trails with the technical challenge pulled out by the root, and the club never got off the ground. If you're not from here, it can seem kind of closed off." That should read, it used to seem kind of closed off. The High Country is undergoing a trail renaissance that has galvanized the local community while simultaneously opening the door to outsiders looking for adventure. With a new bike club and two new purpose-built bike parks, Boone is more welcoming than ever. "Everything changed with Rocky Knob," Jackson says. Rocky Knob is the 185-acre bike park located just east of Boone's city limits that locals started building from scratch in 2009. The park gave locals a mission to rally around (a new club, the Boone Area Cyclists, was born to spearhead Rocky Knob's development), and gave outsiders an accessible piece of High Country singletrack. 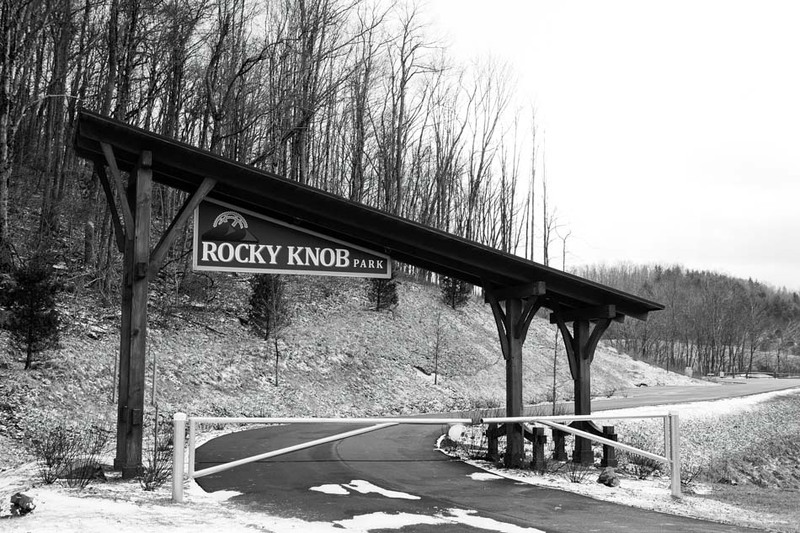 Today, Rocky Knob has 8 miles of purpose-built trail. It doesn't sound like a lot, but they've managed to pack a lot of variety into the system. Hook up Rocky Branch and Boat Rock and you're in for a 900-foot climb via a seemingly endless series of switchbacks. Between those switchbacks, the terrain oscillates between methodical rock gardens and whimsical flow. Stone Binge is a freeride area with a blend of boulders and wooden features–a tiny piece of Whistler in Dixie. 'Ol Hoss has a mile of flowy berms and jumps, then there's the dedicated PBJ jump trail. Also a mid-mountain skinny park, miles of challenging cross country in between, and a new pumptrack near the parking lot. Think of Rocky Knob as one giant skills course prepping riders for the big bad they might encounter out in Wilson. "We built Rocky Knob so everyone could learn to do a tabletop, or drops or jumps in a safe way," Jackson says. "The pumptrack is full of kids all the time. I can't wait to see what they'll be riding in 10 years." At the same time Rocky Knob was being cut, Beech Mountain, the highest ski resort east of the Mississippi, reopened its lift-served mountain biking and slowly began piecing together a legitimate downhill trail system. Beech hosted the Gravity National Championships two years in a row, in 2011 and 2012. And it's only gotten better since then. Mike Thomas, a former collegiate national champ from Appalachian State who turned his experience into a trail-building career, has been building out the eight-trail system and reworking older trails. "There's nothing else like Beech in the South," Thomas says. "To have this downhill park and Rocky Knob in the same town is unreal." Now that both Beech and Rocky Knob are almost built out, locals are turning their attention back to their roots in Wilson Creek. A new IMBA chapter is dedicated to working in the Grandfather District, and is expected to sign a memorandum of understanding that would give them maintenance rights over the trails in Wilson Creek. "We're not looking to build new trail," says Paul Stahlschmidt, president of the IMBA chapter. "There's so much potential with the legal trails that exist, but they're in such bad shape, they can't be ridden because they're too choked up." Just don't expect the forest to get sanitized. "There's still a sense of discovery in Wilson. We're still discovering old trails and creating new ways to link up rides," Jackson says. "That forest is so wild–nobody wants that to change. But we finally have a seat at the table and we're a part of the discussion now. We have a vision." Appalchain Mountain Brewery in Boone, NC. ￼KNOW BEFORE YOU GO | The Grandfather District of Pisgah is full of small Wilderness Study areas, where mountain biking is illegal. Be mindful of trail designations. Rocky Knob is signed well and even has skill-level indicators at trail intersections (rockyknob.wordpress.com), but signage in Wilson Creek is spotty. Bring a map and a GPS. Magic Cycles rents bikes (including downhill bikes at Beech; magiccycles.com). CAMPING | Julian Price Campground sits at the base of Grandfather Mountain, near Price Lake on the Blue Ridge Parkway, with quick access to Pisgah National Forest (recreation.gov). And there's good primitive roadside camping in Wilson Creek at the bottom of Sinkhole near Highway 181. WHERE TO CELEBRATE | The Pedalin' Pig is owned by a mountain biker and offers down-home barbecue and an impressive list of local beer (thepedalinpig.com). Get the pulled rib sandwich and a side of slaw. Appalachian Mountain Brewery has a killer Blonde Ale with plenty of citrus, plus live music and food trucks on weekends (appalachianmountainbrewery.com). 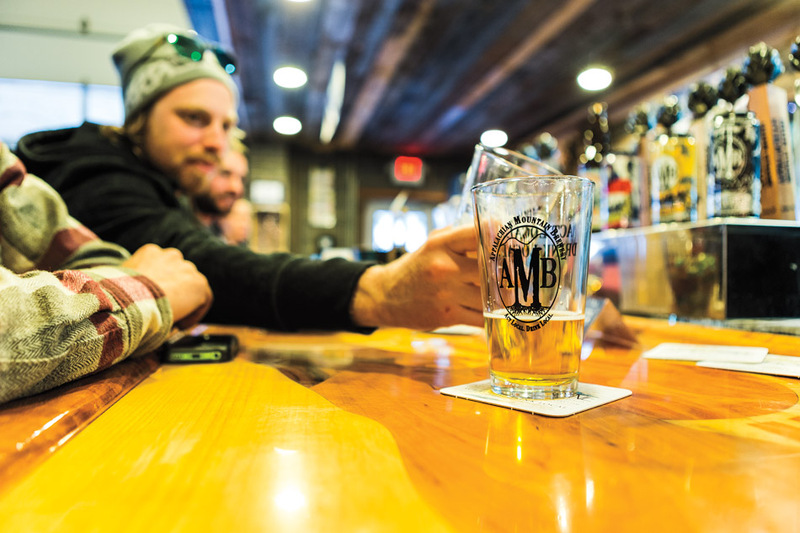 Beech Mountain recently opened a bar and brewpub at the top of the mountain for pedal-up brews. Get the 5506 Pale Ale (beechmountainresort.com).